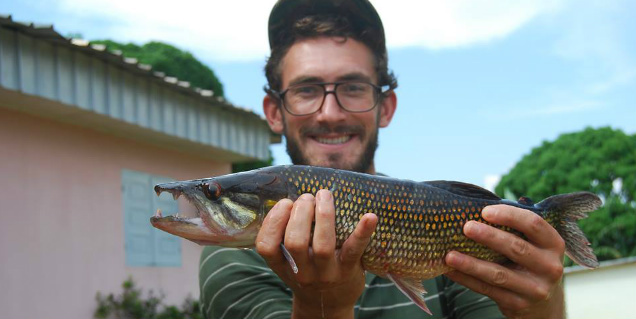 Grad student Joe Cutler with large African pike. Photo credit: Sebastien Lavoue. Instruction in biology for undergraduates at UC Santa Cruz is administered under both the departments of Ecology and Evolutionary Biology and of Molecular, Cell, and Developmental Biology. 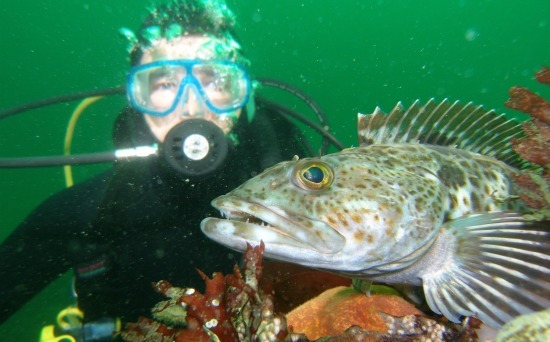 Lower division coursework includes introductory biology (BIOL 20A, BIOE 20B and 20C), general interest courses, and the unique scientific diving course, which is part of UCSC's Scientific Diving & Boating Safety Program. Upper-division coursework includes core advanced requirements (e.g., ecology, evolution) and electives (e.g., ichthyology, plant physiology, disease ecology, population genetics) for the undergraduate majors. Also offered are marine and a terrestrial "supercourses" in alternating years, designed to provide intensive hands-on research experience for undergraduates. These two supercourses are intensive quarter-long endeavours (20 units), where students spend half of the quarter studying advanced concepts in ecology, conservation, and field methods, and developing research projects. The other half of the quarter is spent completely immersed in field research. Graduate instruction includes a selection of core and special curriculum in ecology and in evolutionary biology. Core courses include classes in scientific skills, advanced organismal biology, and evolutionary ecology. For more information on our courses, click on the links in the left column for schedules and course descriptions.